The name Sirupuliyur as per the sthalapurana, came into usage after Vyagrapadar worshipped the Lord with legs, hands and eyes of tiger and attained Moksha. He obtained these things as a boon from Lord Shiva. 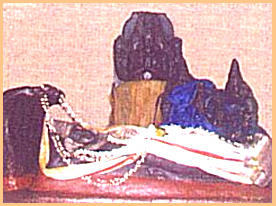 The idol of Vyagarapadar is placed at the foot of the Lord. Of all the perumals, the bujanga sayana posture at this place is the smallest. The temple is located near Kollumaangudi which is near Maayavaram. Dieties Arumakadal, Thirumamagal Nachiyar, Kripasamudra Perumal(Utsavar), Dhayanayagi. Access to the temple One can reach the Kshetra from Kollumangudi Station(on the line of Mayavaram-Thiruvaroor). It is about 3 kms east of the station. Aranthangi - Maayavaram railway route. There is not much of places for staying.